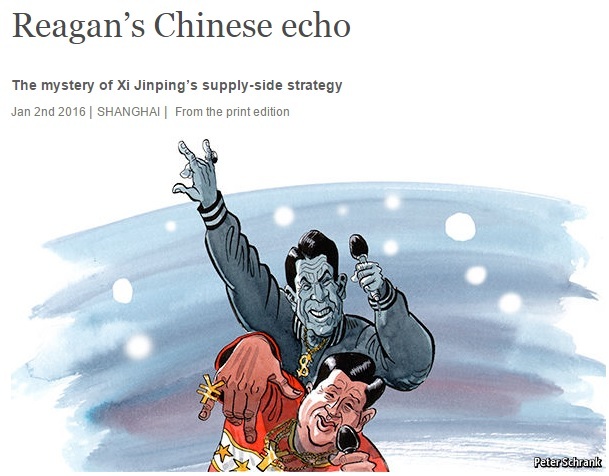 A Reaganesque Recipe to Reinvigorate China’s Economy? The long-term trend in China is positive. Economic reforms beginning in the late 1970s have helped lift hundreds of millions of people out of abject poverty. And thanks to decades of strong growth, living standards for ordinary Chinese citizens are far higher than they used to be. There’s still quite a way to go before China catches up to western nations, but the numbers keep improving. That being said, China’s economy has hit a speed bump. The stock market’s recent performance has been less than impressive and economic growth has faltered. Is this the beginning of the end of the Chinese miracle? If you asked me about six months ago, I would have expressed pessimism. The government was intervening in financial markets to prop up prices, and that was after several years of failed Keynesian-style spending programs that were supposed to “stimulate” growth. But maybe my gloom was premature. An article in The Economist examines the new “supply-side” focus of China’s leader (h/t: Powerline). Mr Xi has seemed to channel the late American president. He has been speaking openly for the first time of a need for “supply-side reforms”—a term echoing one made popular during Reagan’s presidency in the 1980s. It is now China’s hottest economic catchphrase (even featuring in a state-approved rap song, released on December 26th: “Reform the supply side and upgrade the economy,” goes one catchy line). …Mr Xi’s first mentions of the supply side, or gongjice, in two separate speeches in November, were not entirely a surprise. For a couple of years think-tanks affiliated with government ministries had been promoting the concept (helped by a new institute called the China Academy of New Supply-Side Economics). Sounds encouraging, though it’s important to understand that there’s a big difference between rhetoric and reality. Talking about “gongjice” is a good start, but are Chinese officials actually willing to reduce government’s economic footprint? Wow, the communists in China want free markets. Maybe there’s hope for some of America’s more statist politicians! All kidding aside, there’s some evidence that officials in Beijing realize that the Keynesian experiment of recent years didn’t work any better than Obama’s 2009 spending binge. Those who first pushed supply-side reform onto China’s political agenda want a clean break with the credit-driven past. Jia Kang, an outspoken researcher in the finance ministry who co-founded the new supply-side academy, defines the term in opposition to the short-term demand management that has often characterised China’s economic policy—the boosting of consumption and investment with the help of cheap money and dollops of government spending.The result of the old approach has been a steep rise in debt (about 250% of GDP and counting) and declining returns on investment. Supply-siders worry that it is creating a growing risk of stagnation, or even a full-blown economic crisis. Mr Jia says the government should focus instead on simplifying regulations to make labour, land and capital more productive. Making it easier for private companies to invest in sectors currently reserved for bloated state-run corporations would be a good place to start, some of his colleagues argue. Assuming President Xi is willing to adopt the types of reforms advocated by Mr. Jia, China’s economy will have a very bright future. The key goal for policy makers in Beijing should be to improve China’s economic freedom score over the next 10 years by as much as it improved between 1980 and 2005. In other words, if China adopts genuine free markets like Hong Kong and Singapore (and, to a lesser extent, Taiwan), then it will simply be a matter of time before living standards reach – and exceed – levels found in western nations. I’ll close by outlining two challenges for Beijing. First, entrenched interest groups will be an obstacle to pro-growth reform. In this sense, politics in China is very similar to politics in Greece, America, France, and South Africa. The sad reality is that too many people – all over the world – think it’s morally acceptable to obtain unearned wealth via the coercive power of government. Though there are reasons to be optimistic because a strong majority of Chinese people have expressed support for free markets. Second, even if China’s leaders overcome the interest groups and adopt good long-run policy, there’s still the challenge of short-term dislocation and instability caused by so-called stimulus programs and easy-money policy from the central bank. Just like you can’t un-ring a bell, you can’t magically undo the malinvestments caused by those policies. So Beijing will need to weather a temporary economic storm at the same time it engage in long-run reform. P.S. If you want to know a recipe for Chinese stagnation, simply look at the IMF’s recommendations. P.P.S. Some senior Chinese officials have a very astute understanding of why welfare states don’t work. Or, at least, it has a video featuring a rap song in an Asian language of some sort; I assume it’s the video in question.